Elderberry: Sambucus nigra, a wonderful plant ally for boosting the immune system. The tree itself has a long history of its own. Common in the English countryside, the wood of the Elder tree was used for instruments as far back as Anglo-Saxon times and children’s homemade pop-guns in the more recent past. Legend tells of a wise woman, Elda Mor, who lives in Elder trees and offers healing to those who ask for it, providing they offer her proper respect (it is recommend to always offer thanks to the plants for the healing they give us!). The Elder tree has also made a name for itself in the writings of Shakespeare, among others, though often as a sad symbol of grief and death. But despair not, my friends, for the berry is a whole other story. Elderberries contain wonderful properties for health and healing. The berries and flowers have been used for centuries to make homemade wine and cordials (go to town home brewers), and even hair dye. Medicinally, the bark, flower, leaves and berries can all be used. The berries have been attributed many properties over the centuries with claims to effectiveness against rheumatism and epilepsy and as a laxative. Today, the berries are commonly prepared as a tea or tincture. They have a pleasant citrus flavor and are less bitter dried than fresh. Extensive research shows that elder stop the production of hormone-like cytokines that direct a class of white blood cells known as neutrophils to cause inflammation, especially in influenza and arthritis. (Translation – the berries help your body to stop inflammation causing achiness in flu and arthritis). On the other hand, elder increases the production of non-inflammatory infection-fighting cytokines as much as 10-fold. Elderberries are known to be effective against eight strains of influenza. This suggests that elder could be superior to vaccines in preventing flu, because flu vaccines are only effective against known strains of flu, whereas the virus is continually mutating to new strains. Dr. Madeleine Mumcuoglu, of Hadassah-Hebrew University in Israel, found that elderberry disarms the enzyme viruses used to penetrate healthy cells in the lining of the nose and throat. Taken before infection, it prevents infection. Taken after infection, it prevents spread of the virus through the respiratory tract. In a clinical trial, 20% of study subjects reported significant improvement within 24 hours, 70% by 48 hours, and 90% claimed complete cure in three days. In contrast, subjects receiving the placebo required 6 days to recover. In addition, Elderberries have no known contra-indications, though excessive use has been known to cause nausea or vomiting in some cases. Now that we know the amazing health benefits of the lovely elderberries, let’s talk about harvesting, preserving, and using them throughout the winter months, when flu season is upon us. Elderberries ripen towards the end of August and early September, so now is the time to locate wild Elder trees if you don’t have them in your yard. Collect the ripened berries, which will be a rich black to purplish color, and will fall easily off the stem when fully ripe. There are MANY things to make with elderberries, from jams to pies to syrups, so I encourage you to research recipes that most appeal to you! Two simple ways that I love to use the berries for medicinal purposes are drying and using them in teas, and making a basic preventative tonic to keep my immune system strong. To use elderberries in tea: Dry your freshly harvested berries by putting them in the oven at a low temperature (115 or so) on a baking sheet. Parchment is recommended as a liner so that your berries don’t hang out on the metal sheet. A dehydrator is even easier. Once the berries are dried, store in a sanitized mason jar labeled with with the herb name & date you jarred it. Add to teas of your choice, or simply put the dried berries in a mug with hot water and honey. To make an elderberry tonic: This wonderful recipe from Mother Earth News is a simple way to get the most out of your elderberries for flu season! Tip: Freeze freshly picked elderberries in clusters after harvesting to simplify the de-stemming process. Pour water into a medium saucepan and add elderberries, ginger, cinnamon and cloves. Bring to a boil and reduce to a simmer until the liquid reduces to almost half (about 45 minutes to 1 hour). Remove from heat and let cool for 15 minutes. Pour through a strainer into a glass jar or bowl. Discard the elderberries (feed to chickens or compost) and let the liquid cool to lukewarm. Add 1 cup of honey and stir well. (Note: honey is added after the mixture has cooled to keep raw enzymes intact). Pour mixture into glass jars to be stored in the fridge for up to three months. Take the normal dose every 2-3 hours until symptoms disappear. Don’t get caught off guard by cold and flu season this year. Prepare this easy elderberry elixir for a natural alternative for flu prevention and recovery. 1. NEVER give Elderberry Tonic to infants 12 months/under. 2. Elderberries can be used as any other berry for pies, jams, breads, stuffing, etc. 3. Consuming raw elderberries causes extreme GI distress in many people. Try a few berries raw before overindulging. So, get out your tea kettles, darlins', and pour yourself some elderberry tea – or just order up some tasty Flu Fighter from Una – and keep those infections at bay! http://www.motherearthnews.com/real-food/elderberry-tonic-for-cold-and-flu-prevention-zbcz1508.aspx Web accessed 3 August 2016.
http://honest-food.net/2009/07/06/elderberry-season-is-here/ Web accessed 3 August 2016. The Herbarium Monographs. “Elder”. http://herbarium.herbalacademyofne.com/monographs/#ID=1005. Web accessed 3 August 2016. This plant has many powerful medicinal properties, Arnica is a serious healer and comes from the same family as one our faves, the Sunflower ! The roots and flowers are used to treat many conditions. This is a strong one people, so use caution and follow direction for its celebrated benefits! Arnica is native to Central Europe and can be found in forests and mountain pastures. The leaves form a flat rosette, and a flower stalk which can reach 1 to 2 feet high emerges from the center. It bears orange-yellow flowers and the rhizome is dark brown, curved , and shows brittle wiry rootlets on the underside. Arnica is hardy in zones 5-9. This lovely perennial herb blooms in July and prefers a home in moist, well-drained soil with periods of ample sun. The flowers are picked and dried to make medicine. 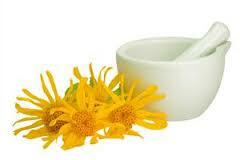 Arnica has been widely used since the 1500's and has a long standing reputation for successful topical treatment . Its constituents are a bitter yellow crystalline principle, Arnicin, and a volatile oil. In early North American colonies the flowers were used in preference to the rhizome but the whole plant is an antiecchymotic, antiphlogistic, nervine. The homeopathic dose has been effective due to its antiseptic , anti-inflammatory, and pain relieving properties. Arnica's actions may be due to two chemicals called helenalin and dihyrdohelenalin. These chemicals may modify the action of immune cells, reduce the activity of chemicals and blood cells that cause inflammation, and kill bacteria. For tender feet, a foot-bath of hot water containing 1/2 oz. of an Arnica tincture will bring great relief. Applied to the scalp it may make the hair grow. Great care must be exercised though, as some people are particularly sensitive to the plant and cases of poisoning have resulted from its use, especially if taken internally. Arnica extract has the power to reach deep tissue layers when applied externally. Its ability to absorb past the skin and penetrate areas that need a little TLC is the exact reason we use it in our Bruise Balm! Come on people, lets start healing!